With its scenic landscape, friendly culture and healthy economic conditions, it’s no surprise that Lexington, Kentucky is often included in lists that highlight America’s best places to live. Taking great pride in our city, most Lexingtonians would agree that continued growth and prosperity across schools, industry and the workplace are of deep importance for our community. And the good news is—there’s a lot of positive momentum underway in the region to feel good about. Results from the Bridging the Talent Gap survey indicate that Kentucky business expansion and job growth are on the rise. In fact, 86 percent of manufacturers, 70 percent of health care businesses and 80 percent of professional, scientific and technical services companies are expecting growth in their sectors in the next three to five years. Yet, 84 percent of companies admit to having a difficult time hiring qualified workers. As the widely-reported talent gap continues to touch nearly every sector across cities nationwide, business and community leaders in Lexington are looking to education as a critical part of the solution. Initiatives like The Academies of Lexington are now offering a hands-on, career-based approach to education across Bryan Station, Frederick Douglass and Tates Creek high schools, to help students not only discover their interests—but graduate high school more prepared for college, careers and life. Eric Sauvage meets with Academy ambassadors for a VIP tour of The Academies of Bryan Station High School. 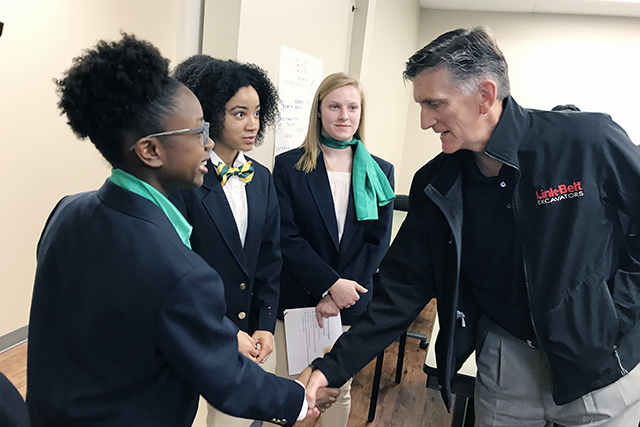 Eric Sauvage, president and CEO of Lexington-based LBX Company and Chair of the Business and Education Network (BEN) board, says that he has no doubt Academies will help our community find common goals to bridge the talent gap in Lexington. He added that his company, which sells Link-Belt hydraulic excavators, scrap/material handlers, demolition equipment and forestry equipment for the construction industry, is feeling the effects of the talent gap in Lexington. “In our business, it’s very difficult to recruit high school graduates with basic technical knowledge, who aspire to become technicians to troubleshoot our machines, learn about our industry and further grow within our organization,” he said. 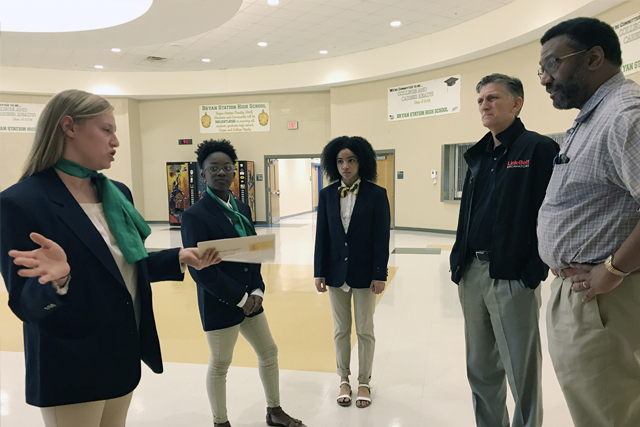 Daryl Smith (far right), and Eric Sauvage (right) discuss career pathways with ambassadors from The Academies of Bryan Station High School. Smith is a Bryan Station alumnus. Daryl Smith, Economic Development Project Manager at LG&E and KU Energy LLC and Chair-Elect of the board at BEN, added that the future prosperity of industry in our region is dependent upon businesses finding the talent they need to stay competitive. Some students, such as those in the Health/Medical Sciences Academies at Bryan Station and Douglass, will even graduate with certifications that will allow them to enter the Medical workforce immediately after high school. And, with the impending retirement of the Baby Boomer generation—the availability of skilled workers who are ready to tackle highly specialized careers across industries is more important than ever. Both Smith and Sauvage added that Lexington businesses have the opportunity to help build a stronger pipeline of skilled workers by getting involved with The Academies of Lexington.